WHEN you look at the specs sheet and read other tests on this ATV, the screaming bullet point is Kawasaki’s 750cc engine, but this machine proved it is more than a one trick pony. 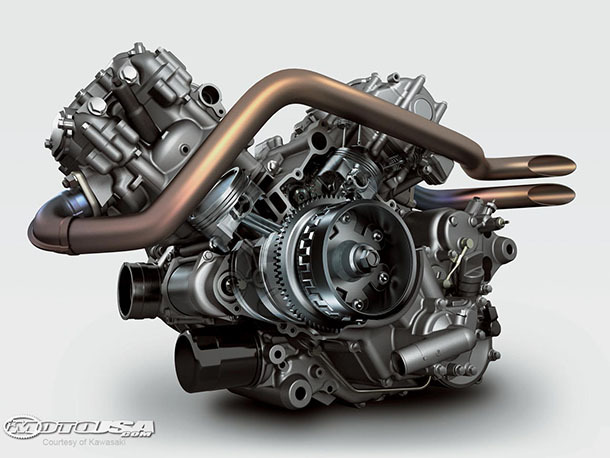 The liquid cooled, fuel injected, 90 degree v-twin pumps out 37kw (@ 6750rpm) and 59Nm of torque (@5750 rpm). It’s a thumb full of power as quads go, but the rest of the features read more like what is on offer for the average car. 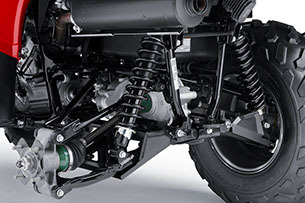 Power steering is a common feature on modern ATVs and Kawasaki has fitted a variable system that is designed to be lighter at low speeds (or in 4WD) and firmer at high speeds, providing more stability over bumps. Speaking of 4WD, it is easily engaged via a switch on the handle bars. Suspension is fully independent for a smoother ride and is adjustable for preload. The whole chassis came in for an update, with an improved steering column and rear stabilisers fitted. Cast aluminium wheels complete the visual look and also help with weight control while the overall visual styling is clean and practical, making it ready to adapt to a wide range of applications. 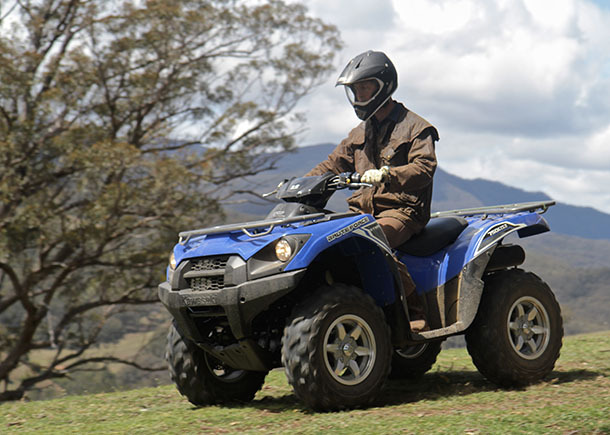 Round it out with diff lock, improved transmission and an enclosed wet rear brake and you have a very capable ATV that certainly offers more that just pure power. Over the course of a few weeks several people had a ride on the Brute Force 750 over a wide range of terrain with the ride impressions all consistently very positive. One of the things that really impressed me was not so much the engine – I expected that to be good – but it was the way the chassis and suspension handled that power. There is no feeling of being too top heavy – the bike offers a really well balanced ride and the handlebars are at a comfortable height. Tough terrain is where the Brute Force absolutely lit it up, launching the bike in the air at will and just smashing through any rough ground. The suspension is said to be firmer than previous models and it did feel that way – the rougher it got, the happier the big Kawasaki performed. On the downhill sections decent control is effective and certainly more pronounced in low range. It is probably not as apparent as other ATVs due to the twin cylinder configuration – look through the specs and you will see most manufacturers opt for a large single cylinder engine – meaning there is greater compression. And what of that huge powerplant? It is everything you would expect of a Kawasaki… smooth, linear power and lots of it. As I said previously, the combination of chassis, transmission and running gear means you can harness that power with no problem at all. If you don’t think power steering is necessary on an ATV, then you need to take a test ride on one of these. In 4WD it was so light and easy to handle making it a standout feature for me. A touch firmer at high speeds would have been good. Overall, completely effortless with a nice tight turning circle. All the running gear appears to be very well protected and covered which means you should have minimal mechanical issues with the running gear (which is why they state an enclosed wet rear brake as a feature). I also liked the spread of the front headlights, I think it definitely increases visibility in the dark (yes I did test that! ), but I really want to see turn indicators fitted for registration. 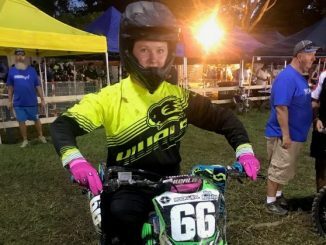 Kawasaki has proven again to me that it has the goods when it comes to engineering. I have no doubt Kawasaki could have made this quad even better, but budget has to play a part, and what it has managed to squeeze into the $12,999 price tag is pure quality. The power is a standout for sure – but I think most agricultural buyers look just as much for stability and good handling. If you read the Kawasaki marketing material everything it nominates as a feature is genuinely noticeable and worthwhile. In my opinion, the big Kawasaki delivers beyond the obvious highlight of the engine, so if you are looking for a machine that can adapt to most applications Brute Force is well worth checking out.